Host an EarthCorps international participant! If you’ve ever considered opening your home to an international exchange participant, you won’t want to pass up this opportunity! EarthCorps international participants are passionate, hardworking, and driven to solve the environmental threats affecting our world. They come to Seattle for a six-month training program for hands on experience through work improving Puget Sound parks, shorelines and salmon streams. EarthCorps’ international participants are aged 22-26, proficient in English, and eager to be training full-time at EarthCorps. Host families and individuals play a vital role in our program. They provide international participants a welcoming home and a window to Northwest culture. Host families must live within a 60-minute bus or bike commute from Magnuson Park. Bus routes that go near Magnuson Park are the 62, 31, 32, 75, and 74 lines. The opening of the University Lightrail station may make southeast Seattle homestays more feasible. Match Your Interests! EarthCorps is committed to finding the right match for our homestay families and international participants. Do you have a strong interest in a particular country, language or culture? Let us know! Apply to be a homestay! Fill out our online Homestay Application. Who are the EarthCorps international participants? EarthCorps international participants (aka “corps members”) are nominated by environmental groups in their home countries. Selected candidates, ages 22-26, enter a six-month service-learning program where they learn new skills through actively participating in environmental restoration projects. EarthCorps seeks out candidates that have some environmental training but are still beginning and developing their career in environmental work. The process is extremely competitive, with about 20 applications for every spot. Since 1993, EarthCorps has had international participants from more than 80 countries around the world. In recent years we’ve had participants from Bolivia, Peru, Nigeria, Russia, Kenya, Kazakhstan, Japan, Haiti, India, Brazil, Philippines, and many more. How long are EarthCorps international participants at at EarthCorps? International corps members come in June and leave in December. They are at EarthCorps for a total of six months. U.S. AmeriCorps members start in February and leave in December. 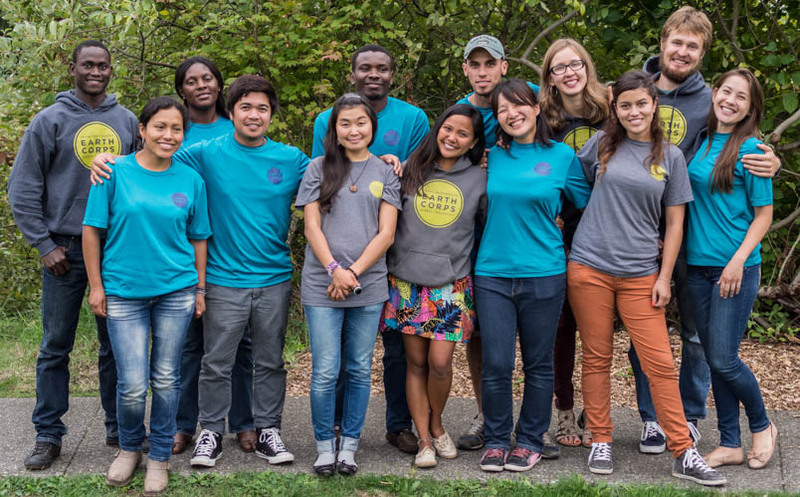 All corps members serve at EarthCorps for 40-hours per week. I am an individual; can I be a “host family”? Yes! Our host families come in all shapes and sizes. We have host families with young children, individuals, empty-nesters, and retirees. As long as you have an extra room and want to open your home to an international participant, we will consider you to be a host family. What time of year would I host? Our international program starts the first week of June and goes through the middle of December. International participants typically arrive during the last week of May to get oriented to Seattle before they start the program. We ask that homestays commit to a minimum of three-months of hosting. If the summer doesn’t work for you to host, consider beginning in September or October. Can I live anywhere in the Seattle Area? Our participants commute by bus or bike and have very long days, so we need our hosts to be within a 60-minute bus ride to EarthCorps’ office located in NE Seattle in Magnuson Park; preferably shorter. However, even if you live a little further out, please feel free to contact us and we can put you on a back-up list. Fill out the Homestay Application online. • 7310 NE 74th Street, Suite #201E, Seattle, WA 98115. You can also email homestay @earthcorps.org or call (206)322-9296 ext. 224 for more information.